Tuesday, April 9, 2019 Registration now open! Tuesday, June 11, 2019 Registration now open! Tuesday, September 10, 2019 Registration now open! Registration Cost: $745 includes on-campus parking at designated garage. Course starts at 1pm - can be combined with the Complex Procedures in EM Course on the same day. Essential Procedures in Emergency Medicine is a procedure-based course specially designed to focus on wound care management, non-invasive orthopedic procedures and lumbar puncture skills. The objectives for each procedure include learning the indications, contraindications, equipment, technique, complications, sites, post procedure follow up and pearls needed to perform the procedures competently. 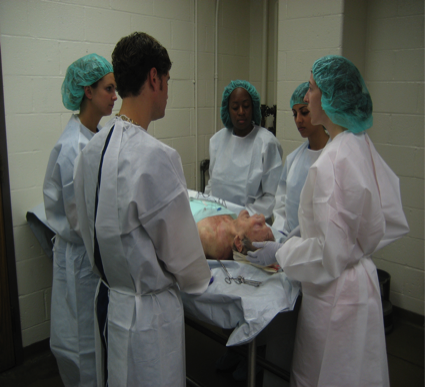 Procedures will be practiced in a controlled setting on human cadavers and high fidelity task trainers. The participants will be divided into small groups of 4-5 students with direct supervision of highly skilled instructors. Participants will have ample opportunity for guided practice of all procedures reviewed. Our course faculty include board-certified emergency medicine physicians recognized in the field of emergency medicine education. They have extensive experience both lecturing and providing skills labs for CME courses offered to physicians and physician extenders. They have authored numerous publications covering pertinent topics, such as procedural education, high-fidelity simulation, wound care, and emergency orthopedics. They are fellowship-trained by the American College of Emergency Physicians (ACEP) in teaching and have received teaching awards from the emergency medicine residency program at the University of Maryland. Our methods are based on educational theories of adult learning and procedural skill acquisition. We offer guided, consistent practice opportunities, characterized by a gradual transfer of the skill from the teacher to the learner until proficiency is achieved. Provides accurate human anatomy and tissue with all the natural variations. Palpation of landmarks and subtle anatomic differences provides a more realistic experience for the learner. All cadavers have been screened for communicable diseases and pose no threat to the learner. As the learner becomes more proficient the simulator may be manipulated to increase the difficulty of the procedure, for example simulating obesity. Use a high frequency ultrasound probes to assist with identification of soft tissue infections and foreign bodies. Cadavers will be prepared in advance to simulate important pathology such as tendon injuries, abscesses, lacerations, joint effusions, and soft tissue foreign bodies. Students will be able to appreciate the subtle presentation of flexor tendon injuries and learn the importance of hemostasis in wound exploration. Abscess incision and drainage will yield simulated purulent discharge. Arthrocentesis proficiency will be assessed with successful removal of colored fluid from commonly affected joints. Cancellations will be accepted 30 days prior to the conference date, and tuition will be refunded less a 20% administrative fee unless the registration can be transferred. A request to reschedule your participation for a future course (based on space and availability) will be accepted one time, and only if made 30 days prior to the conference date at no additional cost. No cancellations or rescheduling will be accepted within 29 days of the conference date, but you may transfer your registration to another provider if you are unable to attend (at no additional cost). The University of Maryland School of Medicine designates this Live activity for a maximum of 5 AMA PRA Category 1 Credits™. Physicians should claim only the credit commensurate with the extent of their participation in the activity. Please click here for a full list of area hotels.